Last week we took a brief tour through the mounted combat arsenal as part of the Swordplay Knowledge section. For the last portion of the Green Spur checklist we ask that you are familiar, at least in theory, with the general mechanics of swordplay from horseback, and how it differs from fighting on foot. Describe the mechanics and timing of throwing a sword blow from horseback. Describe which sword blows can and should be thrown from horseback to a mounted rider and a fighter on the ground. In Fiore’s mounted section, all plays are described either from the walk or the canter, as the trot was considered too rough a gait for an armoured knight with long stirrups. Although Dom Duarte later describes the Ginetta saddle which was used with shorter stirrups and a two-point position that would have made trotting more comfortable and easier on the horse, we still consider the walk and canter to be the more important gaits for mounted combat. Because the walk is a smooth four-beat gait, the rider does not need to worry about the rhythm of the horse’s movement when considering the timing of blows. When both horses are moving, the measure closes faster than when the opponents are on foot, and the mounted swordsman needs to get used to throwing cuts slightly sooner than he might from the ground. The nature of the defence following a cut is different as well. From the ground an opponent’s riposte will still come from the front or slightly to the side. 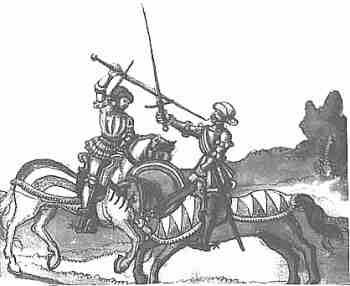 When both horses are moving, the riposte is often an attack from behind, which makes the window guards (finestra and finestra sinestra) particulary helpful in guarding the moving target of your side and back. Holding your horse back, and even reining back as your opponent approaches measure is a way to control the timing of your blow. A nudge with the legs as you deliver your blow will send your horse forward, adding power to the cut or thrust, and quickly moving you away from your opponen’ts counterattack. Much of mounted combat at the walk involves turns on the forehand and haunches, and leg yields into and away from your opponent to protect your horse and gain the advantage of position. The canter was used for mass cavalry charges, quick in-and-out attacks, and running down opponents on the ground, as well as for tournament spectacle. The timing of hand and foot — that is, the timing of your hands with your horse’s feet — depends on whether you are cutting or thrusting. This gives the characteristic da-da-DUM beat recognizable in the William Tell Overture and coconut-assisted in Monty Python’s Holy Grail. A descending cut is best delivered on the 3rd beat of the canter, when the leading foreleg is hitting the ground. This adds the horse’s momentum to your own, creating the most powerful blow. The surge forward from the moment of suspension gives the most forward impulsion, therefore upward cuts can be delivered at the same time as, or just fractionally later than descending blows. For targetting accuracy you want your thrust to be delivered in the smoothest part of the canter. This is the moment of suspension, just after the downward beat of the leading leg. As well as delivering sword thrusts, this is the moment of the canter that will give you the most accuracy at lancing spears or the quintain. Since we don’t even ask you to canter at the Green Spur level, never mind use a sword or spear at the canter, this is all theoretical knowledge for the time being. However, when you are watching horses canter, use this knowledge to imagine yourself delivering your cuts and thrusts at the proper moment. Watching knowledgeably from the ground is a great way to improve your technique from the saddle. This entry was posted in Cavaliere Archives and tagged Green Spur, mounted combat, Swordplay Knowledge. Bookmark the permalink.